“This (photo) is what I’m sending for Christmas presents,” Robb jokes. Just in time for Christmas in 1995, a major item was checked off Robb’s To-Do-List. 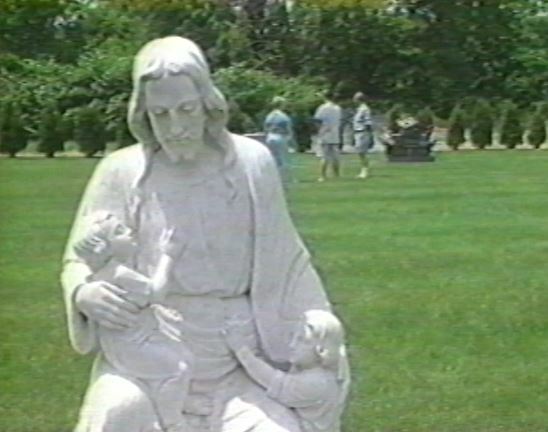 The headstone that he and his parents designed was delivered by Moline Monument to St. Mary’s Cemetery in East Moline. You may remember that in May, Robb and his parents — Lorney and Hattie — chose their grave site during a tour of the cemetery. Now, the project was complete! It isn’t easy for three people to decide on the design of a headstone, which will identify them for perhaps hundreds of years, or until the stone is worn down by time. This story shows the final steps in the design process, then Robb, Lorney and Hattie are at the cemetery as the headstone is delivered and installed. Robb, Lorney, and Hattie watch as the headstone is installed. None of us knew, of course, that Robb only had four months to live. He may have suspected this would be his last Christmas, but he had suspected it the previous year, too. And he had recently signed up for a new drug trial, so anything could happen. I think back to this time, and I don’t believe I gave him a Christmas gift that year. Perhaps I was still trying to keep a bit of professional distance, being a reporter, but I regret it now. If I could do it again, I would have made a big deal of it. Once someone is gone, however, there are no do-overs. Insert deep sigh here. For 20 years, I have cracked up over Robb’s joke at the end of this story, and how Lorney reacts to it. Even in the middle of a profound, potentially depressing event, Robb could lighten the mood.